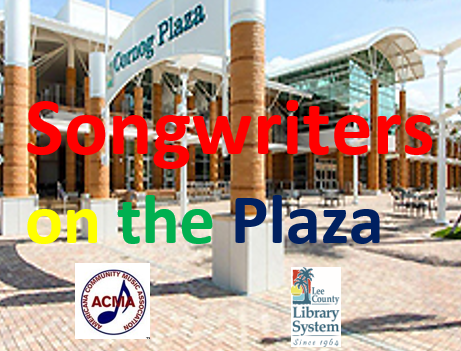 The Lee County Library has joined with The ACMA (Americana Community Music Association), to offer free Acoustic concerts of all original music. Concerts will take place in the Amphitheater, which is located on South Cornog Plaza. Bring a chair or a blanket, shows will be moved indoors depending on weather. Ray Cerbone plays mostly fingerstyle guitar. With his original songs, Ray’s music crosses several genres from storyteller ballads to folk, and country based fun songs to blues. Ray is also the lead singer for the nationally touring band, The Apocalypse Blues Revue. Robert stated, I’ve been writing songs for most of my life. While raising my children and supporting my family, I’ve been fortunate to have had a number of commercial recordings by other artists singing my songs from all over the world. While working in the advertising field, I’ve had the opportunity to write and produce a number of national radio and TV jingles, working closely with many top musicians, producers and other songwriters throughout the U.S. and Canada. And, after all these years, I finally made my first album, IT’S ALL ABOUT THE LOVE, produced by the incredibly talented Fernando Perdomo at Reseda Ranch Studios in California. Robert is currently reside in South Florida, actively writing and performing his songs. Annie Wenz has shared her songs & stomped her dusty musical boots through 25 countries around the world… from festivals, rallies, street corners, schools & arts centers to refugee camps in Pakistan, spas in Malaysia, ESPN videos, Independent Film & theater scores, & blaring speakers at Major League Ballparks, Sirius XM & radio stations internationally. She has collaborated musically with Dr. Jerri Nielsen of the “Icebound” book, Author Robert Macomber , baseball legend Bill Spaceman Lee, & Roy “Futureman” Wooten of Bela Fleck & the Flecktones!